Founded in 1929, Radio Corporation of America – RCA – was the second oldest recording company in US history, the rival of Columbia Broadcasting System (CBS), and RCA Victor was its label forJazz, Blues, musicals and anything else outside of pop. RCAs biggest selling artist was Elvis Presley, recording Heartbreak Hotel in January 1956, and later admitted responsibility for supplying the whole world with The Sound of Music. RCA began experimental stereophonic sessions as early as 1953, and in early 1954 made its first commercial stereophonic recordings. Initially, RCA used RT-21 quarter-inch tape recorders running at 30 inches per second, wired to mono mixers, with Neumann U-47 cardioid and M-49/50 omnidirectional microphones. 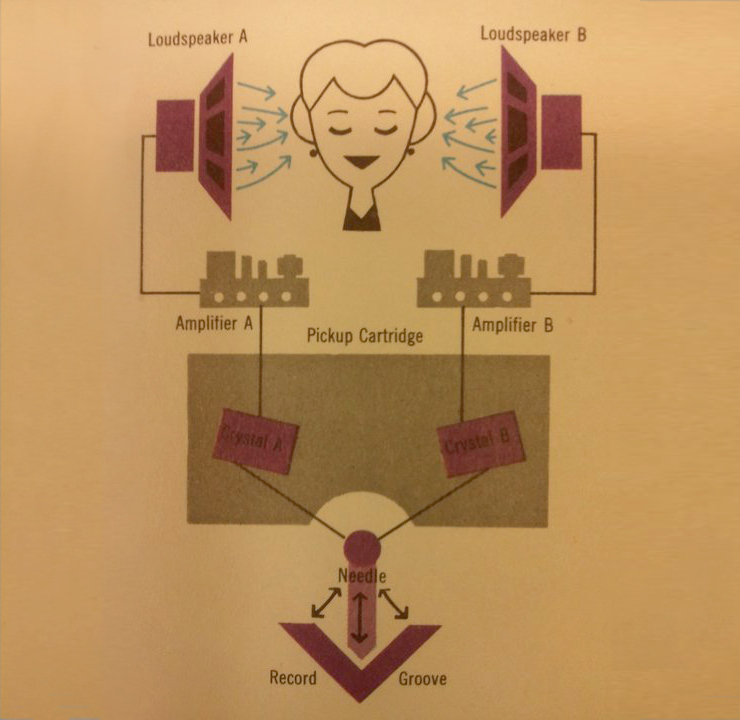 Then they switched to an Ampex 300-3 one-half inch machine, running at 15 inches per second, which was later increased to 30 inches per second. RCA manufactured its own records and also operated RCA Custom, a leading record manufacturer for independent record labels. In September 1954, they introduced “Gruve-Gard” where the center and edge of a disc are thicker than the playing area, reducing scuff marks during handling and when used on a turntable with a record changer. In 1963, RCA introduced Dynagroove which added computer technology to the disc cutting process, ostensibly to improve sound reproduction. A predefined amount of distortion was introduced during the record-cutting process, to cancel out the distortion produced by conical playback styli, used on most playback cartridges in the early 1960s. Dynagroove also involved tonal manipulation of the recorded sound via a dynamic equalizer.Not every LP was a Dynagroove album, and so mono and stereo labels were split into Dynagroove and “regular” records. Regular albums were marked “MONO” or “STEREO”, while Dynagroove albums received special labels featuring the Dynagroove logo. Undaunted by lack of critical appreciation of its so-called scientific advances, in late 1969, RCA introduced a very thin, lightweight vinyl LP known as Dynaflex. This type of pressing claimed to overcome warping and other problems in conventional thicker pressings, but it had a similarly controversial reputation, being derided by some as “Dynawarp” and precursor of the Floppy Disk.. In 1957, RCA ended its 55-year association with EMI and signed a distribution deal with Decca Records, which caused EMI to purchase Capitol Records. Capitol then became the main distributor for EMI recordings in North and South America, with RCA distributing its recordings through Decca in the United Kingdom on the RCA (later RCA Victor) label. This had the lightning bolt logo instead of the His Master’s Voice Nipper logo (now owned by HMV Group plc in the UK as EMI transferred trademark ownership in 2003). In late 1968, RCA modernized its image with a new futuristic-looking logo, the letters RCA in block modernized form, replacing the old lightning bolt logo, and the virtual retirement of both the Victor and Nipper trademarks. The background of the labels, which had always been black for its regular series switched to bright orange. Next: The 50’s/60’s RCA Labels.